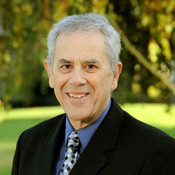 Joseph C. Grana II D. Min. I've been married to Linda (Clifton) Grana since 1969. We have four children: Jolynne, Joey, and Julia; an adopted daughter, Keenan; Son-in-law Joey Aszterbaum; grandchildren Kyler, Josie, Ethan, Ellie, Semeia, Asha, Zion. I enjoy sports, especially the Chicago Cubs!! (Next year is here!) I also enjoy playing basketball, going on adventures with my family, and movie-going. Click here to read an HIU article on this faculty member.